For sale matching pair of quality Technics Dipole Surround Speakers System SB-S500 in very good and clean condition and in full working order. Superb performing speakers system as we can expect from Technics. redefines performance for budget loudspeakers. These speakers are capable of working their magic on a bookshelf or, mounted on stands, these compact loudspeakers are perfect for connecting to simple stereo amplifiers or amplified network streamers. The KEF LS50 was inspired by the BBC commissioned LS3/5a monitors, designed for professional use within a studio setting. 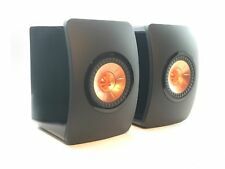 KEF LS50 Gloss Black (Pair). KEF has delved into extensive research in pursuit of faithful sound reproduction and employed those technologies in the LS50. VERY HIGH PERFORMANCE QUALITY SMALL LOUDSPEAKERS ( 26.5 X 16 X 19 CMS. H X W X D). THESE ARE THE BEST-SOUNDING SMALL LOUDSPEAKERS I HAVE EVER HEARD IN 50 YEARS OF LISTENING TO HIGH QUALITY AUDIO. TWEETERS ARE FREE-STANDING RIBBON-LIKE FILM PRODUCING EXCELLENT OPEN TREBLE QUALITY. Audioengine A2 Desktop Speakers - Black. Condition is Used. Dispatched with eBay delivery – Shutl 2-3 days. Celestion diversos años 10 en muy buenas condiciones..
FAR EAST: £95.perfect working order.refurbished cabinets. The new S series uses advanced Kevlar-coned bass/midrange drivers with a specially designed ribbon tweeter, supplying effortless sonic expression to capture all the nuances and passion of the original performance. Full Working Order.8 Ohm-100Watts-20-20.000 Hz. With their newly developed surrounds, the bass units are even more accurate and faster to respond. With power and purity of sound at their heart, the 3050i’s are amongst the most dynamic sounding speakers in their class. Bought them as new from Richersound two years ago (I have the receipt). PLUS I give You a QED cable for each with banana end as it is on the picture. Triangle Signature Theta Standmount Loudspeakers - Mahogany. THETA is a compact bookshelf speaker, mounted on feet. One owner from new UK RRP £2995. Piano lacquer finish : ten coats of paint. repetitive peak power 120 W.
great floor standing loudspeakers, with two 6½ inch woofers, each with its own bass port, gold-plated bi-wiring terminals and Dali's innovative ribbon/soft dome hybrid tweeter module. Sony SS-CRB5 Speakers. 2-way Bass Reflect System. Matched Pair. Latest Model. Roksan Kandy TR5 S2 Loudspeakers inSatin Matt Black. Supplied by Official Roksan agents. The TR-5 S2 woofer is custom designed to ensure an extended and accurate bass performance from a relatively small cabinet. Wharfedale Diamond 225 is a large bookshelf speaker with a 165mm Woven Kevlar Cone, 25mm Soft Dome tweeter, 25-120 watt recommended amplifier power and frequency response of 45Hz - 20kHz making it ideal for larger rooms as well as small rooms. These beautifully built speakers are the perfect match for the JVC AX-SD1 Super Digifine Amplifier. Russia - £69.95. Cyprus, Malta - £54.95. New Zealand - £99.95. Australia, Hong Kong, Macau, Japan, Malaysia, Singapore, S. Korea, Thailand, Taiwan, Vietnam, Philippines, South Africa - £89.95. Bowers & Wilkins MM-1 Hi-Fi Stereo Computer Speakers. From user to listener - MM-1s aren't like other computer speakers. So they don't just look great - they sound amazing, transforming your computer into a superb hi-fi stereo sound system. Edifier R1580MB Active Bookshelf 2.0 Speakers with Dual Mic Input. Due to its low resonance, it is ideal for presentations, lectures and speeches in conference rooms, schools, classrooms and small halls. Edifier R1700BT Wireless Bluetooth Active Bookshelf Speakers (Pair). Versatile speakers will have you wanting to play every device off of them. Plug in your gaming console, computer or TV for exceptional sound quality. Pair TEAC LS-H250 Bookshelf/Standmount Loudspeakers. Maple wood effect veneer with dark grey fascias with silver surrounds beneath brown speaker grilles. All drivers working and in very good condition. Neat Petite SX Speakers. The Neat Petite SX Speakers are a small two-way bass reflex design, capable of great bass extension and an outstanding presentation of all genres. Neat Petite SX Speakers Specification. MONITOR AUDIO. We are an authorised Monitor Audio dealer. 24 months warranty. In very good condition with very little use. They are in superb unmarked condition and perfect working order. We have a range of matching stands available. The result is the Chartwell LS6, designed by Derek Hughes. The overall response retains the smoothness of both the LS3/5 and LS5/9. Custom built from scratch as a project a while ago - Both speakers feature 2 x Skytronic 5.25" 902.125 PP cone speakers. Good sound and a more unique look if that's what you're going for. Weight - 9.5kg each! Stunning pair of Mission 737R speakers in excellent condition and perfect working order. They sound amazing and are from the mid 1980s, nice Teak veneer. Both drivers in both cabinets are 100% perfect, matching serial numbers, a rare opportunity here. "High quality loudspeakers have been an obsession of mine since a very early age. I built my first speaker at the age of 10 and it signified the start of a lifelong pursuit. Wonderful examples that have had one careful owner from new. Systemline were established in 1988 and are a UK based manufacturer of single and multi room audio systems. The Systemline Amplifier. The Systemline E50 is a very versatile system. It’s designed for single-room use but whilst it is suitable for bathrooms, the main unit must not be near water and the 3.5mm hole bung should be used. Technics 2-Way Honeycomb Speaker System Model. Dye cast aluminum enclosure. 100W (Music) Allowable input. Impedance 8Ω/4Ω. Output sound pressure level 88dB/2.83V/m. 57Hz ~ 33kHz-10dB. Frequency characteristic 48Hz ~ 35kHz-16dB. ADASTRA - Bluetooth 6.5" Ceiling speaker set. The set includes 2 x 6.5” ceiling speakers, including an active speaker with Bluetooth receiver and a passive, slave speaker. The active speaker’s RCA line input and output enable daisy-chaining of multiple sets. It's not often you will find a pair of double cubes in this condition and complete with wall brackets (fixing screws/rawl-plugs not included).